Last night Blue Eyes played in mommy’s box from her school supplies. 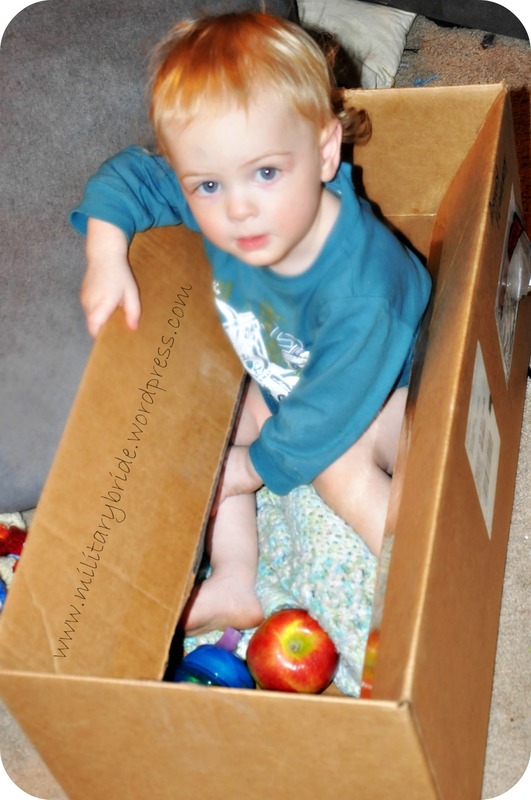 What is it about all boxes that kids love? I wish I could go back and look at it through their eyes so I can be relearn the wonder. Mommy folded in the sides and put little man’s favorite blankie and a sippy cup in the box and he spent all evening climbing in and out of it and watching Mickey. Surprisingly he went to bed fairly early, even with double naps. Now Blue Eyes is unraveling balls of yarn all over the living room. I shouldn’t be surprised, I keep a small basket next to the couch with smaller balls of yarn that I’ve been working with. What could be more natural than a 16 month old throwing those tempting colorful balls in all directions. What’s better than watching the colors mesh and intermingle until mommy is pulling out her hair trying to untangle them? Somehow he knows my frustration and tries to come cuddle with me. That’s when I notice the smell….. it’s an odd mixture of dirt and daddy’s deodorant. A quick scan of the room shows me what I already figured, the dogs had let themselves out again, and he’d gone out with them. But what I couldn’t see is the daddy smell. Which means it could be hidden anywhere. Now there’s the choice, do I continue trying to untangle my balls of yarn, or do I try to find the missing deodorant? I’m thinking for now, the deodorant can stay hidden, I want to get this yarn up and out of sight. He was super tired all day yesterday. I think part of that is because we were at the hospital for mommy the night before. It wore him out. He took two naps and both were over 2 hours long. I’m really hoping that means he will be super happy and ready for the babysitter today. Just in case, I’m going to find his, “I’m crabby but cute” shirt. I already founds socks and pants, let’s hope I don’t forget to bring the socks. Little miss thing is already kicking up a storm. It’s a little early but at least I know she’s doing well in there. Anyone have any tips on getting her to stop kicking my hips? I wouldn’t normally mind, but she seems to get lower and lower and I have seven weeks left! Posted in Baby, blogging, boys, crafts, crochet, life, military, military family, mommy, motherhood, Parenting, Uncategorized and tagged babies, baby, baby boy, boxes, boys, crochet, DIY, family, home, kids, life, military, military family, military life, mommy, motherhood, sleepy, son, yarn. Bookmark the permalink.